267 in stock Need More ? Reprint. Originally published: Boston, Mass. : Houghton Mifflin, 1993. In a perfect world, Jonas begins to see the flaws... THE GIVER is the classic award-winning novel that inspired the dystopian genre and a major motion picture adaptation for 2014 starring Jeff Bridges, Meryl Streep, Katie Holmes and Taylor Swift. It is the future. There is no war, no hunger, no pain. No one in the community wants for anything. Everything needed is provided. And at twelve years old, each member of the community has their profession carefully chosen for them by the Committee of Elders. Twelve-year old Jonas has never thought there was anything wrong with his world. But from the moment he is selected as the Receiver of Memory, Jonas discovers that their community is not as perfect as it seems. It is only with the help of the Giver, that Jonas can find what has been lost. And it is only through his personal courage that Jonas finds the strength to do what is right... 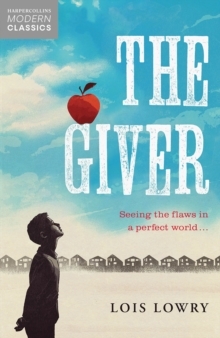 The Giver is the award-winning classic of bravery and adventure that has inspired countless dystopian writers as the forerunner of this genre.